"I do not want to condemn or judge Filatov's point of view. Maybe I did something wrong, I do not know..."
Jeroen van den Berg: "Chess and the Internet are a perfect combination. 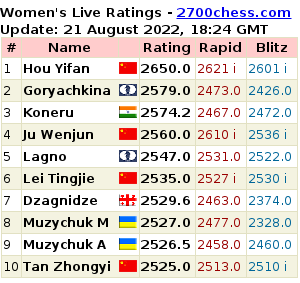 The game will be safe in the next 10-20 years"
"There is no necessity to change the time control in Wijk aan Zee..."
Peter Svidler: "We Finally Won Something", Evgeny Tomashevsky: "Russian Vodka Will Be in Russia!" "It's been quite a long time since that success..."
Vladimir Kramnik: "To Put It Mildly, I Have Not a Bit of Respect For Topalov"
"We are really like one big family. I am happy to be playing for this team...."
Vladislav Artemiev: "I Spend on Openings More Time Than I Would Like To"
"I arrived in Baku with the hope to pass through at least two rounds..."
Evgeny Sveshnikov: "Only fools learn from their mistakes. It seems I am one of them..."
"I told Karpov over breakfast: I am not like others, I am stronger after losing..."
Veselin Topalov: "I Am Not a Chess Fanatic!" 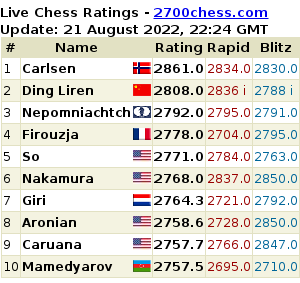 "Kramnik is the luckiest man in the history of chess. He never won a single cycle..."
Alexander Belyavsky: "To go down in history as world champion, you need to win a match"
"Kasparov quit chess because he did not want to be number two..."
"If you can get out of the opening against Anand, then you can play against him"
"It's disturbing if they shake the table or bang the clock. In such a case, I would complain to the arbiter..."
Yan Nepomnyaschy: "Maybe I Will Buy a Telescope"
"Computers are good assistance, but they're dangerous at the same time. A computer can kill your intuition..."
"Playing in Moscow is more convinient to me, partucularly because obtaining the British visa is difficult..."
"For happiness, you need something bigger than that. I'm just very glad..."
Vladimir Kramnik: "Petrosian's chess legacy helped me a lot in my match vs Kasparov"
"For example, in Stavanger I just went a bit mad..."
Dmitry Andreikin: "My primary concern is my family duties"
"These days, I work on chess mostly on my own..."